A pulley is a grooved wheel firmly attached to an axle. A rope or a cable fits into the groove and passes over the wheel. A fixed pulley is fastened to one spot. The fixed pulley gains nothing in force or distance, but it changes the direction of the force. 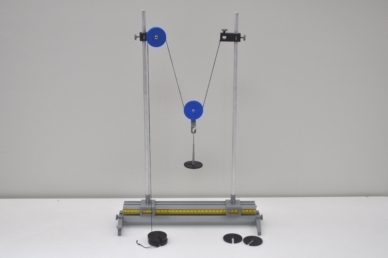 A movable pulley moves along a rope. It decreases the force but it must act through a longer distance. A compound pulley (also known as a block and a tackle) is the combination of fixed and movable pulleys. The fixed pulley changes the direction of the force and the movable pulley decreases the applied force. 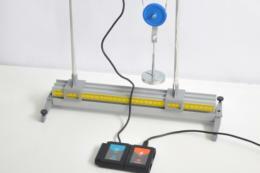 The NeuLog pulley kit along with the force logger sensor lets the students explore various options of pulley arrangements. 35 cm track, Two track legs, Two 20″ rods, Two track riders, Two boss heads, Two 100 g slotted masses, Three 50 g slotted masses, Slotted mass hanger, Rod with pulley (perpendicular), Pulley with hook, Thread.